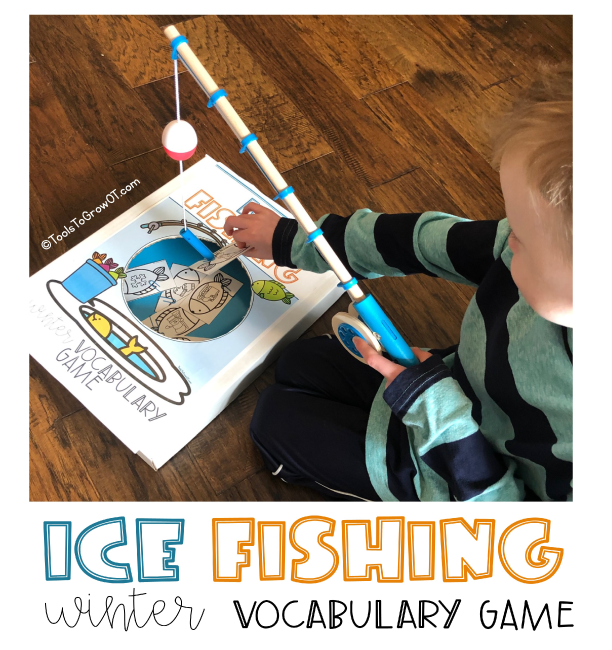 Ice Fishing Winter Vocabulary Game | Blog | Tools To Grow, Inc.
Children always enjoy the pretend game of “fishing”, and during the winter months what could be more fun than Ice Fishing! Children with proficient receptive language skills can understand age appropriate information that is verbally presented to them. A child with difficulty following directions can have many challenges with executing daily routines at home and school. Such children will also struggle with advancing their academic abilities. During this game the child will receive many opportunities to listen to and execute directions in a supported manner. Children require a well-developed sight word vocabulary for automatic word recognition. Word recognition is the ability to recognize written words correctly and without effort. Vocabulary is all the language and words understood by a person. During this game the child will be exposed to many winter themed vocabulary words in a repetitive and supported manner. He/she will be given the opportunity to expand their recognition and identification of the written word related to the winter season. Articulation of Speech Sounds- Clearly stating the names of the winter images on the Fish Cards. Articulation refers to how a child makes speech sounds using their mouth, lips, and tongue. A child with an articulation disorder has difficulty making individual speech sounds. A child with an articulation disorder displays atypical production of speech sounds characterized by substitutions, omissions, additions or distortions that may interfere with intelligibility. Using this game, children will have a fun and supportive setting to practice speech sounds. Bilateral coordination skills refers to the ability to skillfully use both sides of the body simultaneously. This includes using both sides of the body at the same time for the same action, such as using a rolling pin. It also includes using the same action at alternate times, such as walking. Finally, it includes the ability to use different sides of the body for dissimilar movements such as holding the paper down with on hand while writing with the other hand. As noted, bilateral coordination is necessary for executing complex fine and gross motor movements. Children with difficulties in this area may struggle with using clothing fasteners, tying shoes, completing hand crafts, scissor use, and participating in gross motor physical activities. 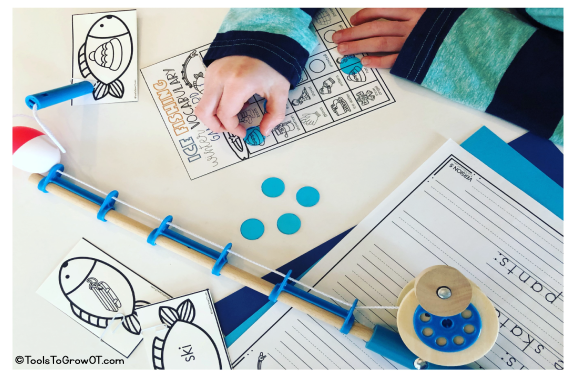 During this game, the child will use the fishing pole to “catch” and “release” the fish from the magnet which requires the hands to perform different, but complementary actions. A stable shoulder girdle that can be held in varying active ranges of flexion, abduction, adduction, and rotation is vital to proficient hand use skills. This proximal stability is a foundation for more distal fluid mobility of the forearm, wrist and fingers. During this game the child is required to sustain his/her shoulder in a variety of positions while he/she removes the “fish” from the end of the string. A child’s handwriting capabilities have significant impact on their academic performance. Using winter themed paper and vocabulary, a child will have the opportunity to practice writing. Game Card Covers/Objects to mark squares: Use your own manipulatives. Examples: buttons, beans, pennies, cereal, or any other small items. Use dabbers or crayons to color in images, or mark an “X”. Use dough to smash onto the squares. 1. Print out Fish Vocabulary Cards on cardstock. Print Pages 3 & 4 and Pages 5 & 6 double sided. This will allow for the vocabulary word to be on one side and the image of that word on the reverse side. 2. Cut out each Fish Vocabulary Card and laminate (if possible for durability). 3. Place a paper clip on each Fish Card that you will be “catching” with a fishing pole. (STEP 1) Using a lid from photocopy paper, lid from a box, or large shoe box lid - cut out a 7 x 7 inch hole. (STEP 2) Attach Fishing Pond Game Image, as decoration, to the top of the lid (if desired). Fishing Pole: Create a magnetic fishing pole using a long stick/dowel, string and magnet. Game Cards: 6 different versions included. Each child will require one game board. Print and laminate for durability. 1. Scatter the fishing vocabulary cards under the lid in the open circular area. 2. Youngest player (if more than one player) goes first. 3. 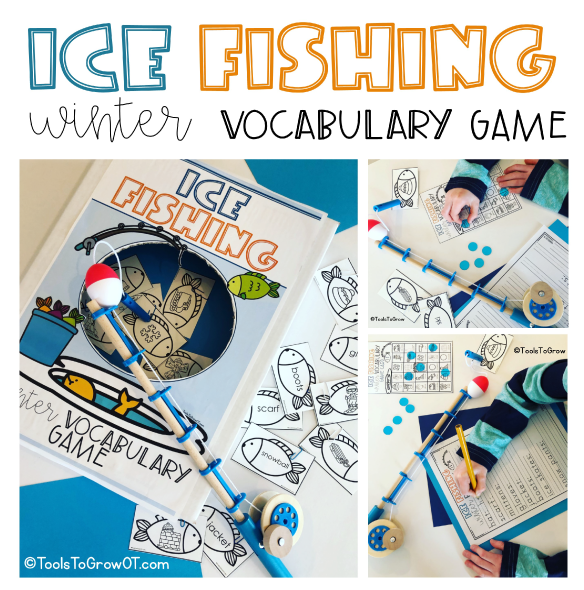 Child uses the fishing pole to “Fish” for a vocabulary card. 4. Child removes one fish from the pole. 5. Child reads the word or identifies the image. 6. The child describes this item OR uses this word in a sentence. 7. Each child playing will then place covers on the called image (or use dabber, mark “X”, smash dough etc.) if the word and image read is on their Game Card. Images/Words may appear more than once per card. Cover all images if that word is read. 8. That fish Vocabulary Card is now out of play (*do not place back under the lid). 9. The next player then repeats steps 3 - 6. 10. Winner: Once a player has 5 squares covered, in a row, horizontally, vertically, or diagonally, they call out “ICE FISHING” and win the game. Or, play cover all squares, 4 corners, etc. Winner has to read all their covered words in order to win. - Optional: Using the paper provided, the child is to write a sentence using that word or print the word (depending on the level of the child). Therapist can ask additional probing questions regarding the vocabulary cards. Examples include: Where is this used? Where does this belong? How does this feel? What does this do? Child can move in a designated manner when making his or her way to “fish”. This may include walking backward, carefully spinning, walking on knees, skipping, walking on toes, walking on heels, walking sideways, or sitting on a scooter board. Be careful not to drop the fish on the fishing pole! This game can be used as part of an obstacle course. 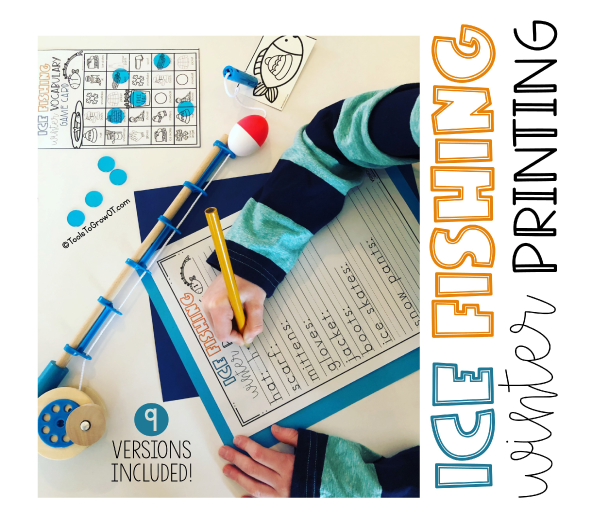 After using the fishing pole to retrieve a card, the child may grasp the vocabulary card in their hand as they navigate through the course. Use lined paper (separate PDF) to write words or print sentences using Fish Vocabulary Cards. 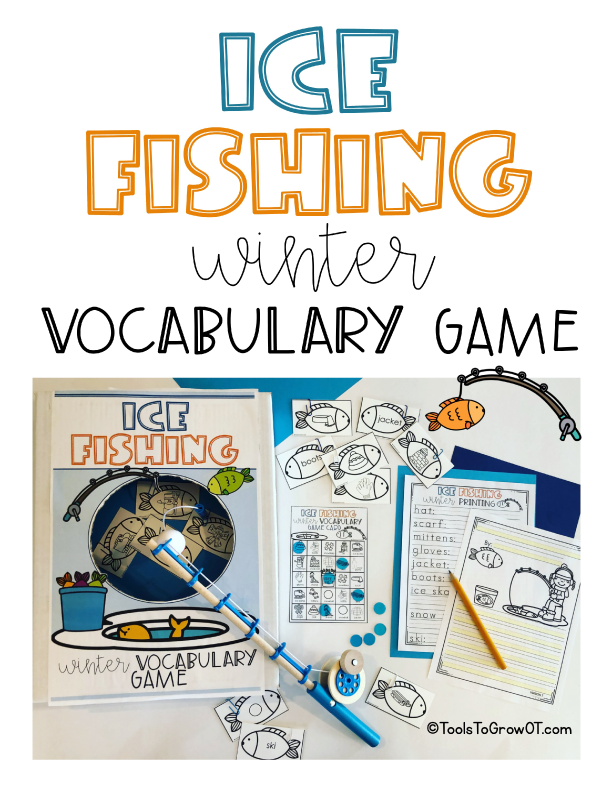 Find this NEW Winter Vocabulary Ice Fishing Game Here!